Cincinnati Reds 2nd Baseman Brandon Phillips was arrested last month for "reckless driving" with his mom in the car. 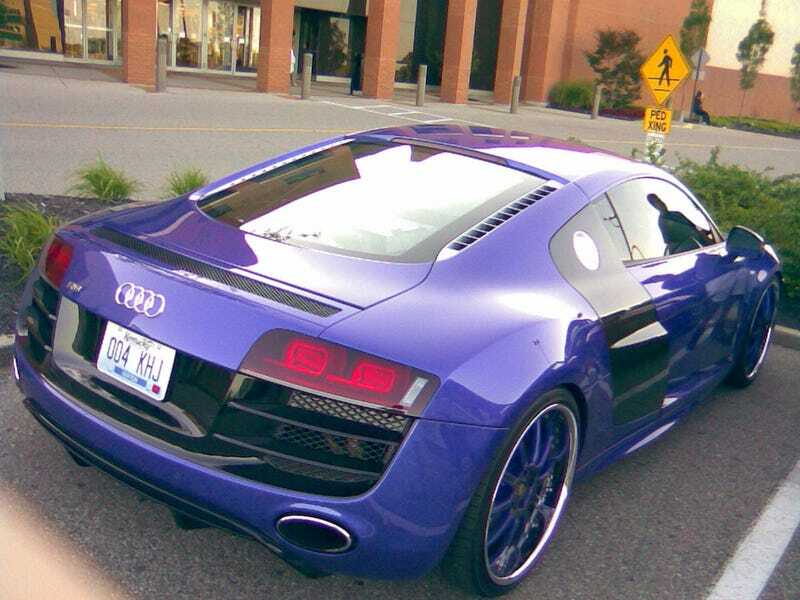 This is the hideous purple Audi R8 V10 he was arrested in. Update! Phillips was arrested last month on a charge of "reckless driving" after getting popped for going 72 mph in a 35 mph zone — or 37 mph over the speed limit — with his mom in the passenger's seat. His excuse? "I'm not really mad. I'm thankful that I'm safe and I get to play today… I really didn't know how fast I was going. That's how powerful the car is. It's like 700 horsepower and when you're going 50 it feels like you're not really going anywhere like you're going 30 or 20. I apologize for what I did." Police say Phillips was polite the entire time and the "reckless driving" charge was mostly as a result of the high rate of speed. The car in question, though not identified in most reports, is almost certainly this Audi R8 V10, spotted in Phillips' care at a St. Louis area malll today. Though the car only comes stock with 525 hp, this R8 is clearly modified and can easily produce the vague "like 700 hp" amount Phillips mentions. And what of those modifications? The purple paint is bad enough without the matching wheels. But what's that little emblem in the center? A golden baseball mitt. And there's apparently one on the engine cover to match. Classy. Update: It turns out this is not a V10-powered R8, but actually a regular V8-powered model with V10 body parts and nowhere near 700 hp. Double lame.